Seaford Town Council has been working with Fields in Trust to secure the Sutton Park Road War Memorial site in perpetuity to honour the memory of the people who lost their lives in World War I. Fields in Trust protect vital open spaces all across the UK to ensure they are safeguarded forever. The Centenary Fields programme was launched in 2014 in partnership with the Royal British Legion to secure open spaces in perpetuity where there is a link with World War I. This dedication as a Centenary Field has proved to be a unique way to commemorate the World War I centenary and also ensure these spaces are there for future generations to remembers those who lost their lives. 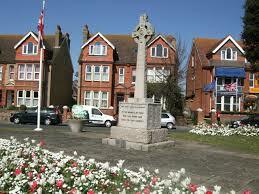 The memorial, maintained by the Town Council, is on one of Seaford’s main roads through the town centre remembers not only those who fought and died in World War I but also the soldiers and civilians of Seaford who died in the Boer War and World War II. The memorial has been on this site since 1952, having previously been located on Dane Road since its erection in 1921. The site is well visited, with sympathetic landscaping and seasonal flower beds and seating for any to use. It also houses the Town flagpole where a variety of flags are flown throughout the year, including the Battle of Britain flag and Merchant Navy flag, each flag having its own story and acting as a reminder of the country’s history. In 2015 a memorial paving stone and plaque were installed in memory of Cuthbert Bromley VC who had previously lived in Seaford and along with five of his comrades from his Regiment was awarded one of the most prestigious honours, the Victoria Cross, for his bravery in Gallipoli in 1915. An unveiling service was held in August 2015, with many people turning up to mark the occasion, including Mr Bromley’s descendants. On Sunday 13th November 2016, the Remembrance Sunday service as arranged by the Royal British Legion will be held at the War Memorial; it will be a 10.30am arrival for 11am start. In due course a plaque will be installed at the memorial to show that it is a Centenary Field and that it will therefore be around to be appreciated by many generations for years to come.